This is about PC version’s information again. 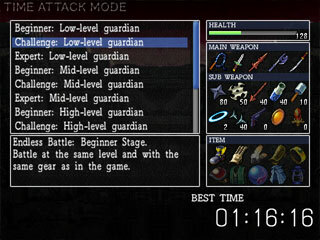 The PC version has Hell Temple and time attack mode that are as additional download contents on WiiWare version. Hell Temple was remade as well as the main part. On top of that, if you read a certain ‘stone tablet’, the difficulty level goes up and become hard mode. 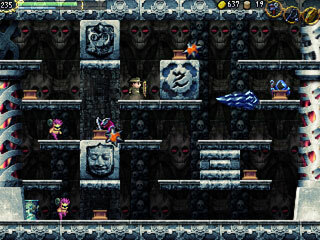 Then, Hell Temple also become hard mode on the PC version. You will be able to enjoy the wonderful Hell tour. 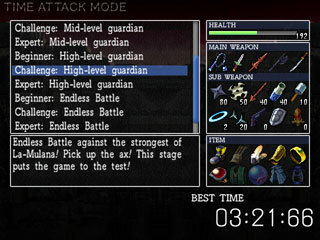 WiiWare version’s time attack mode is a bonus, but we think the mode isn’t suitable for time attack since it’s too long to fight against all room guarders. We split room guarders into 3 groups depending on their strength, and make it short and handy. And also, you can try it with different equipments. We are afraid it doesn’t have a network ranking system, but you can easily take screenshots because it plays on PCs. Hope you guys upload your brilliant records on your blog or something. I love how we’d go months with no info and now we’re hearing stuff every few weeks if not days. This sounds awesome and I can’t wait to play it! I just hope there are graphic/sound adjustments in case my comp can’t handle it (then again it runs a PSX emulator near-flawlessly so it should be fine…I hope). Hell temple is Hell, and Duracuets is The Satan. You. Cruel. Gits. We utterly love you for this. oooh so tweaks to Hell Temple and the Boss Rush/Time Attack mode? Still quite excited for this release! I will get the best record.